Godzilla Day, an unofficial event celebrated in Japan on November 3 celebrates the first showing of the Godzilla movie in 1953. Following on celebrating the tradition, Bandai Namco's Godzilla VR will be rolled out throughout various locations in Japan on this date. While the game has already been available since September at the VR Zone in Osaka, November 3 will see the game roll out to another VR Zone in Shinjuku and other VR Zone Portals. The life-like four player game see's players sit in motion platforms with HTC Vive VR headsets. Players take on the roll of helicopter pilots with dual flight sticks trying to stop Godzilla from destroying Tokyo. 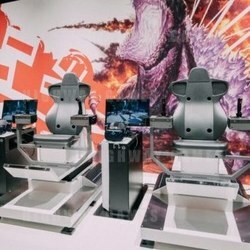 Competitors are given an array of weapons to take down the monster in a life like VR game which also features custom motion chairs to add to the reality.